Jaguar Club of Austin event this month is garage tour at Jeff's Restoration - Taylor, TX. Jeff Snyder - the owner - is a world renowned car restoration specialist. His shop currently has multitudes of cars - from E-type, to AC Cobra to XJ220. 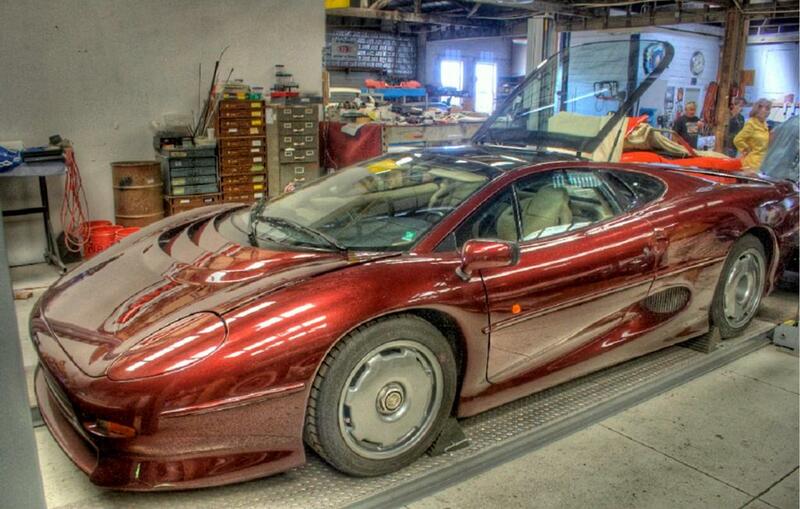 Here's a post-processed shot of the XJ220 sitting on the dyno. More pictures later - have to fly to Malaysia for a couple of weeks. Interesting, but slightly odd looking dyno, I always thought the the wheels were supposed to go round rather than the car going up and down. Have a safe trip Bob, look forward to some more pics. The car actually just 'sits' on the dyno - since they don't have any other place to store it inside the main garage. It's not in running condition yet - apparently it has not been serviced since it was purchased by the current owner (AZ-based, retired neurosurgeon - lucky guy). The initial estimate for the restoration is around $50K. What's interesting is that the engine seems very small for a car that size. Also - Doug may be able to comment here - the fuel tank is not really a tank - but something resembling a bladder - similar to what US Army deploys on Forward Area Base. We got to see the bladder actually since it was taken out. 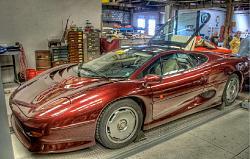 The shop also just finished another XJ220 - and for that one, the owner actually took it to a show in Houston (Classic Chassis) inside the Reliant Stadium just last week. Currently at Taipei International - the connection's to PEN is not until 5 hours from now ..... The flight in was somewhat interesting, that there are at least 10 teams of 2 people, doing some type of TV adventure racing show, so there's a pretty big entourage of cameramen, soundmen etc. They're not saying though what show it is - claiming NDA .... If I had to guess, it's the Amazing Race. Both those cars are awesome. thanks for posting the pics.